How to Easily Master Format SAMSUNG GALAXY S6 EDGE (SM-G9250 / SM-G925A / SM-G925F / SM-G925FQ / SM-G925I / SM-G925K / SM-G925L / SM-G925S / SM-G925T) with Safety Hard Reset? Tips and tricks for fix SAMSUNG GALAXY S6 EDGE problems. The new LCD full body view is available at SAMSUNG GALAXY S6 EDGE, this phone have 5.1 inches LCD screen width, using Super AMOLED for good and bright color and also already use Corning Gorilla Glass 4 screen protector. This is very important because the edge of LCD will easily scratch if the glass does not cover with scratch protector. Overall the specifications not different between Samsung Galaxy S6 VS Samsung Galaxy S6 Edge. This phone also use Octa Core processors which are divide into double Quad Core processor Quad-core 1.5 GHz Cortex-A53 & Quad-core 2.1 GHz Cortex-A57. 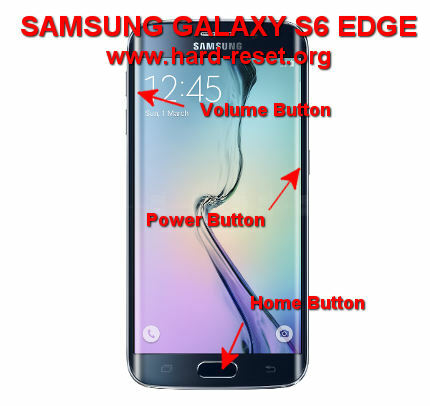 How to Fix or Problem Solving for Recovery SAMSUNG GALAXY S6 EDGE (SM-G9250 / SM-G925A / SM-G925F / SM-G925FQ / SM-G925I / SM-G925K / SM-G925L / SM-G925S / SM-G925T) hang or not responding or malfunctions or stuck or freezing or bricked ? We will get several factory default applications when we activate our SAMSUNG GALAXY S6 EDGE at the first time, this is because Samsung already have interesting own apps for their users. But because we have big internal memory that have several options at 32 GB or 64 GB or 128 GB, then of course we can install many additional free applications from Google Play Store like Facebook or Instagram or Whatsapp or Skype or Line Messenger or WeChat or Blackberry Messenger (BBM) or Path or Pinterest any many more. Some apps have already included but we still need to update for latest versions. Although SAMSUNG GALAXY S6 EDGE does not have external memory microSD slot, but having that kind of internal memory will not make this phone easy to insufficient memory, moreover we can use cloud storage that already available from Google or Dropbox. The problems will happen when some applications from Google Play Store not compatible with SAMSUNG GALAXY S6 EDGE or we install some virus or malware apps. This can make our SAMSUNG GALAXY S6 EDGE become hang or stuck or bricks or frozen or boot logo loop. In some case, our LCD touch screen become not responding. When we get this problems, we have to force shutdown or force soft reset or reboot to restart all running applications and remove temporary files also caches. If this problems still happen, then we have to do hard reset or master format. Please note, doing hard reset will remove all important data or photo or video from this phone, therefore we have to backup all important data before doing hard reset. How to Force Shutdown or Force Soft Reset or Reboot or Restart SAMSUNG GALAXY S6 EDGE (SM-G9250 / SM-G925A / SM-G925F / SM-G925FQ / SM-G925I / SM-G925K / SM-G925L / SM-G925S / SM-G925T) ? We have to know that SAMSUNG GALAXY S6 Edge body make the battery become non removable battery, if there is something happen with our phone, then we can not force shutdown by open or remove the battery at SAMSUNG GALAXY S6 EDGE. If we want to force shutdown when our phone get hang or LCD touch screen not responsive with our finger touch, then we can press and hold POWER button until this phone shutdown automatically. When the phone still normal, but we want to remove caches and temporary files, then we can press and hold POWER button until pop-up menu appear. Choose Shutdown / Power Off / Reboot menu. This process of soft reset or reboot will not remove any important data or installed applications. The SAMSUNG GALAXY S6 EDGE (SM-G9250 / SM-G925A / SM-G925F / SM-G925FQ / SM-G925I / SM-G925K / SM-G925L / SM-G925S / SM-G925T) will doing the process of restoring to factory default. How to Restore and Reinstall Clean Android Operating system / firmware at SAMSUNG GALAXY S6 EDGE (SM-G9250 / SM-G925A / SM-G925F / SM-G925FQ / SM-G925I / SM-G925K / SM-G925L / SM-G925S / SM-G925T) (Reformat) ? When the first time we activate this phone, the Android Lollipop has already installed and ready to use at SAMSUNG GALAXY S6 EDGE. We only need to sign-in with Google account and Samsung account, then all functions will run. However, because of some applications crash or wrong setup, then SAMSUNG GALAXY S6 EDGE operating system can be damage or corrupt, which make this phone become act not normal or sometime can not start-up properly. If this problem happen, then we have to reinstall or reformat the factory default operating system. First we have to know, that clean factory default file source of Android operating system or firmware already saved safely inside SAMSUNG GALAXY S6 EDGE ROM. Why safely? because this file can not access from normal booting, so we can not accidentally remove this file source. Therefore, if we want to reformat or reinstall or restore the OS, then we do not need to copy or connect our phone to other device. Just follow simple steps to hard reset above, then clean factory default Android operating system will be reinstall automatically. How to Unlock or Fix or Bypass or Solutions for SAMSUNG GALAXY S6 EDGE (SM-G9250 / SM-G925A / SM-G925F / SM-G925FQ / SM-G925I / SM-G925K / SM-G925L / SM-G925S / SM-G925T) forgot password code or security lock screen pattern or pin (lost password)? We have to give more security protections for our important data or photos or movies or applications from SAMSUNG GALAXY S6 EDGE. There are several factory default options to give security protections like Fingerprints or Pattern or Password Pin. We usually use screen lock pattern protections because easy and fast to open, but we can use anything we want. Please note, the problems will happen when we forgot security protections answer at SAMSUNG GALAXY S6 EDGE, what to do? Do not worry, because we can bypass or unlock forgot screen lock or password or fingerprint or face-lock security protections using Google account and Backup PIN. We will give more information about PIN Backup after this. Back to Google account to bypass security protections. Please give several time wrong answer continuously until this phone locked or freeze about 30 seconds. At this time we can find Forgot Password / Pattern button, press this button, then we can give our Google account username and password that we have already signed-in before at the right field. If we can not access our Gmail account at this phone to unlock or bypass, then we have to do hard reset or master format. What is PIN BACKUP at SAMSUNG GALAXY S6 EDGE (SM-G9250 / SM-G925A / SM-G925F / SM-G925FQ / SM-G925I / SM-G925K / SM-G925L / SM-G925S / SM-G925T) ? Samsung give additional help to unlock or bypass forgotten security protection at SAMSUNG GALAXY S6 Edge. Although we are sure about our security protection, but sometime we can forget about it. When we give the security protection at our SAMSUNG GALAXY S6 Edge, it also give step to put our own PIN as BACKUP PIN. This backup PIN use to bypass or unlock forgotten security code later. Use above steps to unlock forgot password or screen lock pattern security protection using Google account or Gmail username and password. How to Improve Performance SAMSUNG GALAXY S6 EDGE (SM-G9250 / SM-G925A / SM-G925F / SM-G925FQ / SM-G925I / SM-G925K / SM-G925L / SM-G925S / SM-G925T) to make run more faster? With using Octa Core processor with double Quad Core processor and also 3 GB RAM, then this phone will run faster for running all applications from Google Play Store. But after use several period, some users will get slowly response at SAMSUNG GALAXY S6 EDGE, why this phone become slowly? Usually this problems happen because there are too many applications run in the background or some not appropriate applications use more RAM. We have to know that some factory default applications or additional apps from Google Play Store will keep run in the background for wait data update or command. All applications will use RAM and processor resource, if there are too many run together then in some period, the RAM and processor resources will be insufficient. Then our SAMSUNG GALAXY S6 EDGE will become more slowly because because it need to find which applications that can force shutdown to give more RAM free space. Therefore, we have to uninstall some not use applications. If we want to make our SAMSUNG GALAXY S6 EDGE performance run faster again like new, then we have to consider doing hard reset or master format. Is That Any Secret Code for Doing Format SAMSUNG GALAXY S6 EDGE (SM-G9250 / SM-G925A / SM-G925F / SM-G925FQ / SM-G925I / SM-G925K / SM-G925L / SM-G925S / SM-G925T) ? We can try to use secret code for doing hard reset SAMSUNG GALAXY S6 EDGE (SM-G9250 / SM-G925A / SM-G925F / SM-G925FQ / SM-G925I / SM-G925K / SM-G925L / SM-G925S / SM-G925T) is *2767*3855#. But please remember to always be careful typing that code, because the SAMSUNG GALAXY S6 EDGE (SM-G9250 / SM-G925A / SM-G925F / SM-G925FQ / SM-G925I / SM-G925K / SM-G925L / SM-G925S / SM-G925T) will doing hard reset and remove all data and installed applications. How to Improve Battery Life Longer of SAMSUNG GALAXY S6 EDGE (SM-G9250 / SM-G925A / SM-G925F / SM-G925FQ / SM-G925I / SM-G925K / SM-G925L / SM-G925S / SM-G925T) For Solving Battery Drain Faster Problem (Battery Saving / Extent Battery Life)? Unfortunately this fast and good Android smartphone only use 2550 mAh battery capacity. If we are heavy users, then this capacity will not enough for lasting one day without charger. Therefore we have to do some tricks for make SAMSUNG GALAXY S6 EDGE battery not fast to drain or stay longer. Please reduce the LCD brightness as low as possible, because LCD is the main battery drain beside GSM 3G or 4G data network. We can try to do some adjustment to make battery life stronger for daily activity. Please try to turn off some not use connection like Bluetooth / Wifi / GPS / NFC. We also recommended to set manually the LCD brightness as low as possible. Some applications which always update data also will make battery drain, that is why we should use only important applications although our phone processor and RAM still have more capacity, but this can help to reduce battery usage. The information from this page describe about fix restar samsung G9250,fix restart samsung G9250,hard reset samsung s6 edge,samsung s6 edge hard reset,sm g9250 problems. If you need another resource for hard reset, use search function at this homepage or find from our related posts. How to Easily Master Format HUAWEI Y7 PRIME with Safety Hard Reset? How to Easily Master Format SONY XPERIA X COMPACT with Safety Hard Reset?